A giraffe against a blue sky in Kruger National Park. A goose looking up at the sky while sitting on a tree stump in the Crocodile River. Some mornings, when I sit down at the big table on the veranda to begin to prepare the day's post, I'm at a loss for a few minutes. What can I say and show today that will retain the interest of our readers all over the world? Many of our readers are from countries where life is very different from our lives and from that which they know. That fact in itself is sufficient to hold their attention for awhile but, over the long haul? We hope so! The marshes along the shore of the Crocodile River. We never want our readers to grow tired of our stories and photos especially while we're here during this extended period in Africa. At the very least, every 90 days, we'll be off to other African countries to ensure we can return to South Africa which we're using as a base. In only 24 days, we'll be leaving South Africa for Zambia, Botswana, and Zimbabwe as we begin to round out our African experiences while complying with immigration laws. Rapids on the Crocodile River. No boats are allowed on this dangerous river, a habitat for crocs. There's no guaranty we'll be allowed to leave and re-enter so many times in these remaining 10 months but we're hoping to accomplish this lofty plan we set out from the get-go. In the interim, these 90-day stints in between our travels are filled with such purpose and pleasure that we're beside ourselves with sheer joy. This morning as I write this at 8:15 am, we've already had two zebras, four bushbucks, four kudus and dozens of Helmeted Guinea Fowl hanging out in the dirt yard in our clear view from the veranda. Had this branch not been obstructing this elephant she may have charged us when we suddenly came upon her while driving on the paved road in Kruger. What a spectacular way to start the day! The first thing I see after heading outdoors after showering and dressing for the day is the wide grin on Tom's face as he looks back at me from his steady stance at the edge of the veranda with the yellow pellet container in his hand, happy, fulfilled and excited to share what he's seen so far. He gets outdoors well before me each morning. I have a tendency to lounge in bed until 7:00 am or so reading the world news on my phone. Once I'm up I can get ready for the day in no time at all, highly motivated to see what's going on. Every night, we attempt to take photos of the bushbabies, eating from the cup of yogurt we place on their little stand in a tree. In our posts, as you long-time readers so well know, we incorporate snippets of a more personal nature. Some have asked, "Why post such personal matters?" The answer to this is simple. There are literally millions of travel related sites on the web, most extolling the virtues and downfalls of various tourist sites to visit throughout the world often while providing valuable information for travelers. Tom took this photo that makes me laugh...Mutton Chops on the left and Scar Face on the right, already on his knees in prime position for eating pellets. Of course, we complied. We love it when these two stop by, often twice in a day. We're a little different. 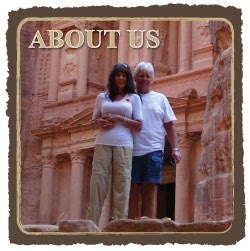 We include information about places we've seen and our experiences, good and bad. However, we include the realities of who we are, also good and bad, what we think and feel and how we relate to each other and the world around us. At times, that information is highly personal, information people don't necessarily share even when in a group of close friends. And, here we are, sharing it with the world. This bushbuck seems a little large to be nursing. No doubt, mom will send her on her way to fend for herself. For example, yesterday, we both had doctor appointments with Dr. Theo in Komatipoort as mentioned in yesterday's post here. Our intent was to review our immunization records, which we had with us and begin the process of updating some vaccinations sooner rather than later. Also, I wanted to further discuss my gastrointestinal issues with Dr. Theo since the problems had recently returned after a short-term reprieve. I was so hopeful during the two-week period where the discomfort was minimal, thinking that perhaps, now that I was off the PPIs (proton pump inhibitors), which have a lot of side effects, things would improve. These two male zebras are now regulars, visiting every few days. Alas, they did not. Over the past few weeks, I've been in terrible discomfort dreading the prospect of having to go to Nelspruit for invasive medical tests. I'm one of those people who totally freak out having to have invasive tests. I suppose most people feel the same way but are braver than I.
Dr. Theo examined me again and felt confident that I don't need invasive tests when he suggested I try another medication, an H2 blocker (i.e. Pepsid, Tagamet) which has considerably fewer side effects and may be very helpful for what he considers to be gastritis. My blood tests results were perfect much to our relief. Zebra drinking from the pond after eating pellets. He also suggested some dietary restrictions including foods high in acid, such as coffee, tea, chocolate (don't eat these anyway) and anything carbonated (there go my sparkling water and diet tonic). I'm busy checking online for highly acidic foods to ensure I avoid them, along with all the other foods and drinks I avoid anyway. After reviewing our records, he insisted we follow through on several vaccines but only had one available in his office, the rabies vaccine which he injected in both of us. He wanted us to wait three weeks and return for those that need to be updated, such as typhoid, hepatitis, and a few others he's going to research for us. I love a doctor who does research rather than sticks to the "old ways' he already knows! This morning in the bright sunlight, two females and two babies, regular visitors stopped by for pellets. In the background is Wart Face who can be very bossy around the pellets. Even the aggressive and territorial guinea fowl are scared of him. Dr. Theo is expecting improvement for my condition within four to five days. Once again, I'm hopeful. I took the first pill last night at bedtime and actually had a great night's sleep. Whether I can attribute this to the medication or not is questionable at this point. Today, we're heading out to lunch with our new neighbors Rina and Cees from The Netherlands to the same restaurant Louise and Danie had taken us on Easter Sunday, the Border Country Inn. No doubt, we'll have a pleasant afternoon with our next door neighbors. May you have a pleasing day with those near you! With the sun shining in Fairlight, Australia, we opened the sliding glass door only to have a visitor come to see what I was cooking. Three Magpies visit every day to see what morsels we have for the day. Carnivorous scavengers Magpies are always on the hunt for a tidbit of meat. Please click here for more.